Veganuary is a registered charity that encourages people to try going vegan for the first month of the year. They reported that in 2018 the campaign grew by 183%, with 168,542 people signing up to go vegan. In an attempt to profit from the growing interest in a plant-based diet, savvy retailers have jumped on the bandwagon and have launched a range of vegan products designed to take some of this version of the ‘green pound’. 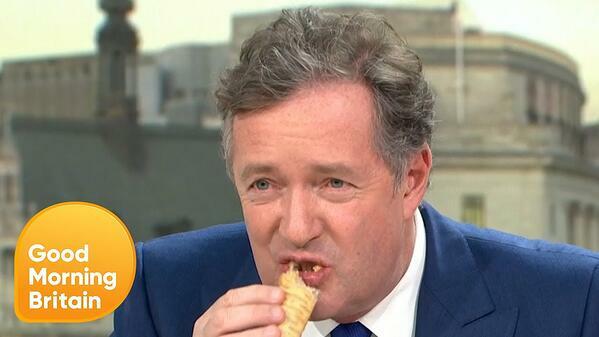 A couple of weeks ago, Greggs went viral by launching their new vegan sausage roll, which divided the country in half, most notably Piers Morgan who was (and is still) outraged! Plant Kitchen contains over 60 items that are suitable for vegans from No Pork Sausages to Cauliflower Popcorn. Marks & Spencer are not the only supermarket expanding their product range, Waitrose also launched a sizable range of own-brand vegan products in October last year. It is clear that Itsu intend to be at the forefront of this healthy movement by offering a range of vegan products and continuously innovating to add more products to their menu. 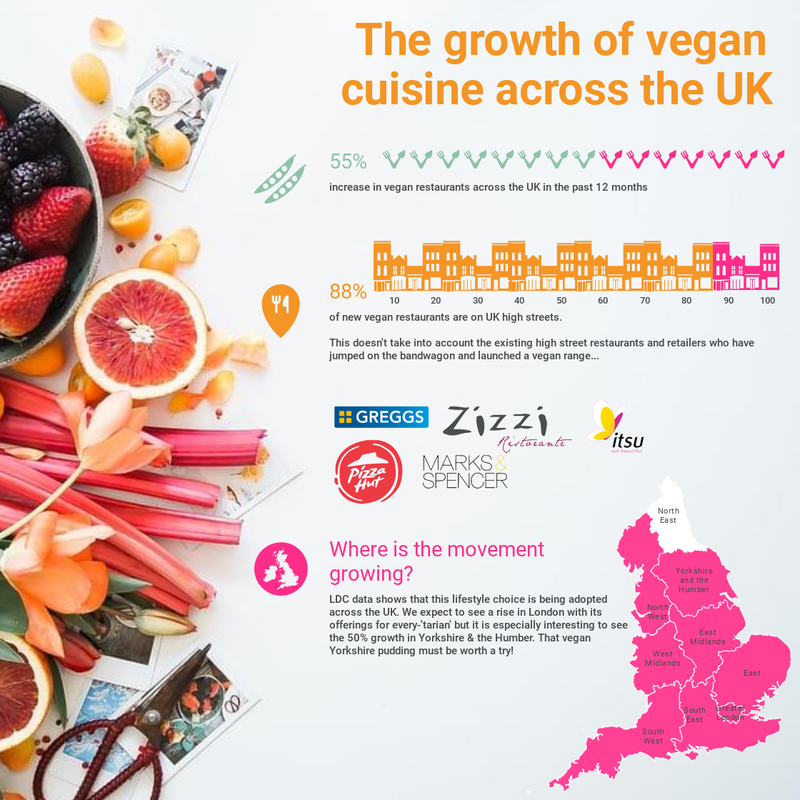 LDC data supports the notion that the demand for plant-based meals is on the rise, as in the 12 months from January 2018 to January 2019, there was a 55% increase in vegan restaurants GB wide. It’ll come as a surprise to no-one that the majority of these vegan restaurants are in London (18), however the rest of the country is following this trend as growth can be seen in every region apart from the North East and Scotland. What may surprise you is that there is a booming vegan culture across Yorkshire and the Humber with 12 of 48 total vegan restaurants located in this region! Sheffield leads the way for vegan restaurants in this region and also has the accolade of being the greenest city in Europe, with 4.5 million trees, more trees per person than any other city. All of these vegan restaurants are currently independent, so in the LDC office we’ll be taking bets on which brand will emerge as the first ever vegan chain of restaurants. Whist the total number of vegan restaurants is still relatively small, we highlighted this increase in June last year at our mid-year summit, showing how small nuances in data can help us to predict national trends. In the first six months of 2018, leisure saw a significant net decline, the first net decrease for four years. Whilst pubs were a main contributor to this decline, it is still encouraging that vegan restaurants experienced growth despite the challenging trading environment the market is facing. Further to the increase in numbers of vegan restaurants, it is evident that supermarkets, restaurants and other food operators are innovating their menus to cater for these new markets as veganism emerges into the mainstream. 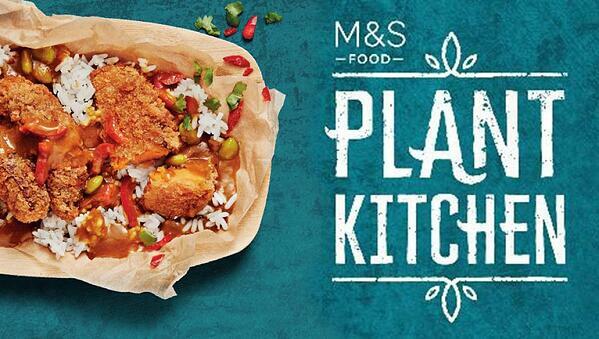 Brands are under enormous pressure to innovate and stand out in order to survive, so the influx of vegan-friendly dishes may not come as a surprise as retailers aim to get an edge over their competitors. Offering this new cuisine not only opens up a new market of consumers and jumps on a national trend, but also gives retailers an opportunity to show customers that they care about the environment. The detrimental impact of meat production on the environment has been widely publicised in recent times, and retailers who want to speak to the ethically-minded generation are able to show that they also care about sustainability.